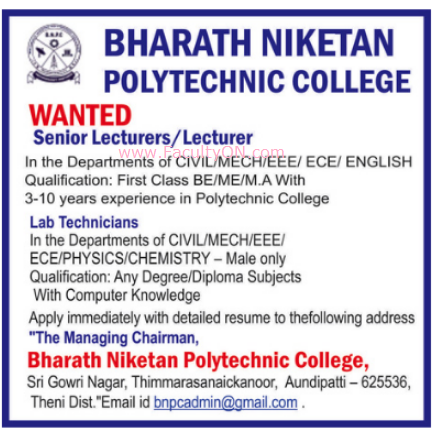 Bharath Niketan Polytechnic College, Theni has advertised in the DINAMALAR newspaper for the recruitment of Teaching Faculty- Lecturers / Senior Lecturers / Lab Technicians jobs vacancies. Interested and eligible job aspirants are requested to apply immediately from 07th October 2018. Check out further more details below. About College: Bharath Niketan Polytechnic College(BNPC) is an AICTE approved institution, affiliated to Director of Technical Education (DOTE), Chennai. Bharath Niketan Polytechnic College, established in the year 2010, by the efforts and endeavors of Nehru Rural Development Trust (NRD) with an objective of imparting quality technical education for the rural community. BNPC Institutions provide a variety of stimulating environments for intellectual development, free thinking,and personal growth, challenging its students with dynamic learning opportunities and equipping them with the skills, insights, attitudes and practical experiences that are necessary to take up responsibilities in the society. How to Apply: Interested and eligible candidates are requested to send application along with their CV, copies of certificates and PP size photo to the following email address or postal address.